Trying to figure out how much of an upgrade Skyrim Special Edition is over the original release, with whatever little footage available. Bethesda confirmed what many were expecting/hoping for: a Skyrim remaster for PS4 and Xbox One. The publisher is even giving it away for free on PC to owners of the original game and all its add-ons. Though we don’t have much footage of the new version to go on, people are already starting to compare it with the 2011 version. Digital Foundry, too, has put them side by side to see if they could learn more. Because there isn’t much footage to go on, the site used the available trailer in conjunction with uncompressed screenshots. 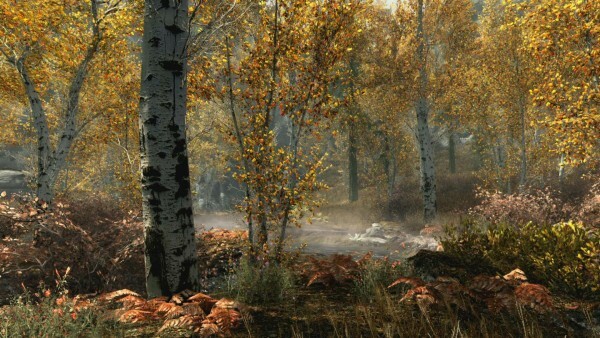 The Special Edition runs at a native 1920×1080, but seemingly won’t go over 30fps, the same frame-rate target for the original, as well as Fallout 4. Work has clearly gone into making the remaster, however, with new assets added in like plants, stones, trees and more around the area shown. Like Bethesda promised, a new depth of field field effect and volumetric god rays have been, visible also when compared against the original. According to the report, texture quality looks to match that of the PC version’s highest setting. Ground detail in particular doesn’t look to have been upped. Generally speaking, lighting seems to be biggest winner here, resulting in more vibrant colours and warmer tone. Take a look at both side by side in the video below, and read the rest of the report at the link. The Skyrim Special Edition is out in October.